From the col with Grey Peak it is an easy ascent. The rock on the western slopes offers pleasant climbing. 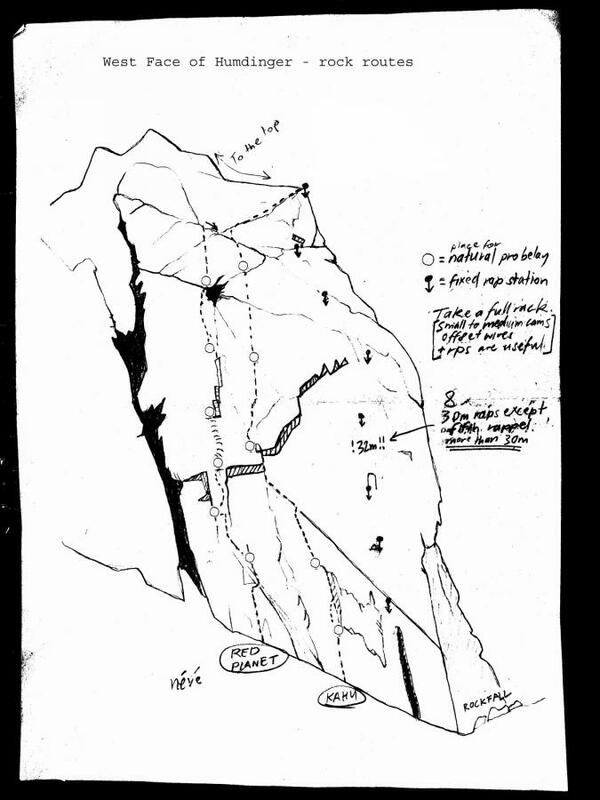 The first ascent from this direction was by Frank Alack, H K Douglas, W E Wilson, Dec 1934. Ian Whitehouse, Brin Williman, Dec 1971. The route takes a direct line towards & through the red pillar that leads through the roofs on the left hand side. Start. Look for a crack that leads out of of a small alcove just to the right of the red rock. Climb past the the vertical crack out of the alcove & move onto orangr textured rock. Traverse right directly under a pink, blank peice of rock and move up to belay in a crack. Traverse left and up the slab. Move to the lefthand crack (watch the hollow flakes). Pass through the steepest ground on the right crack before moving left into a crack/ corner belay. Step right onto the pillarand climb through techical ground heading first left then right & up to belay in cracks. climb up the dark coloured groove to the base of a clean left facing corner & big belay ledge. Climb the corner & belay above the top of the tower. Trend left & towards the left side of the hole/ cave above the belay just beyond this. The route take the right side of the face and passes through the roof on the Rh-Side of the rectangular feature on it. Climb the crack & belay under the Lh-facing corner. Climb the triple cracks & the Lh- facing corner. From the top of the tower step left & climb through the bulge. Climb up, then right to gain the Lh-trending ramp. Follow this then climb the chimney before breaking left past the orange block. Follow the break left, then head right & up onto clean orange rock. Belay on a flat spot. Climb up on easy ground heading right of the big hole/ cave above. Follow the Rh- Trending breakto the top of the light coloured headwall & find a bolted rap anchor.